View the training via WEBCAST (taped November 13, 2013) on your device at a place and time convenient to you. You will be emailed access instructions within 1 business day. 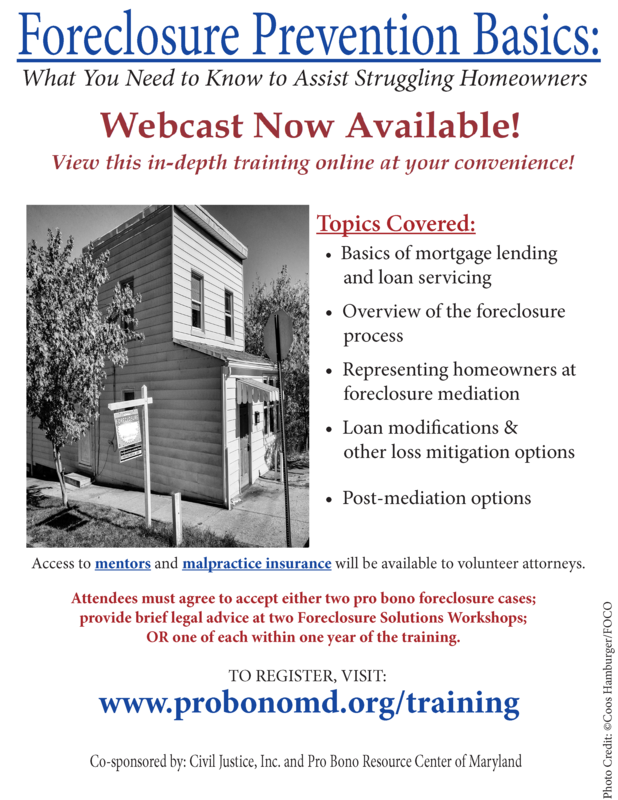 This training, offered as part of PBRC’s Home Preservation Project to attorneys eligible to practice in Maryland, covers the basics of mortgage lending and loan servicing, the foreclosure process, representing homeowners at foreclosure mediation, loan modifications and other loss mitigation options, as well as post-mediation options. Participating attorneys must agree to fulfill two (2) units of volunteering within one year of registering. One “unit of volunteering” is EITHER providing brief legal advice at one (1) foreclosure solutions workshop OR taking one (1) case placement from the Project. Questions? Contact Kiki Rist at krist@probonomd.org or 443-703-3052.